Spring is teasing with sweet blooms appearing here and there. The sweet scent of honey catches on my nose, causes me to stop in my tracks, to stand and inhale the freshness in the air. Dear Spring, it’s so nice to see you again–to see traces of you on the horizon. I look up into that wild blue sky and want to spin and run through the grass. Tonight my mind is content, yet it wants to see the blinking cursor change from a blinking cursor to words and thoughts upon the page. I’m distracted by the fact that I’m usually asleep by now and by a homework assignment that is due tomorrow and I’m distracted by a book that I want to read and another and another–and the night air and the moon that was full on Monday night and how lovely it was peeking down at me through the bedroom window and the stars looked bright last night and I always look for you dear moon and I’m sure to wish you a good night; I smile at you and I know you’ll be there even when you’re not. My mind is still and at the same time its active, but it’s not making any sense except in its own orbit. wonder what you kept in that case of yours. cigarettes, smoke rising above you. stooped, not letting anything stop you. to stop and say hello, sit down, have a conversation. lovely–like a single flower on its stem. tears in all shapes and sizes. About a month ago, I looked down at my thighs and regretted donating my ThighMaster to the second hand store. That ThighMaster hung in my closet for years unused, so it made perfect sense to be gone with it. I looked on Amazon to see how much they cost and didn’t feel like paying full price. I practiced restraint as I was about to click on “add to cart.” I told myself that if I saw a ThighMaster in one of the second hand stores, I would buy it. What are the chances, I thought. I really didn’t think I would see one. I finally put the whole idea out of my head. This past weekend, my significant other and I were browsing through one of the local thrift stores. He was in the men’s section with other knick knacks and I was looking at shirts in the women’s section. I had a handful of items in my hand, not certain if I really wanted the shirts and one sweater. My significant other called my name out, I looked up from the rack, then he lifted his arm to reveal a ThighMaster. I let out a happy gasp and hurried over. I took it from him and found a chair to sit on to test it out. This one seemed to have more resistance than my other. I have to get this, I told him. He noticed that I had set aside a bunch of shirts and asked if I was getting them. I showed him each item and we agreed that they weren’t that exciting. I put all the clothes back and left the store with a ThighMaster. This time, I hope to keep it out of the closet. Though this is a trifle in the scheme of life, it reminded me of the power of intention, stating our wishes, and having them manifest. My one significant intention is to take my significant other to New Orleans. I’ve been there once as a solo traveller and loved it. I’d like to take him there and experience it together. I will have to save every penny. I’ve visualized being there with him and am working toward this goal. It will be tricky to put New Orleans out of my mind–In my experience, intentions seem to manifest best when you’ve completely put the thought out of your mind and leave it in the universe’s hands. It feels good to be awake early this morning. The past few weeks I’ve wanted to continue sleeping; and I have, waking up later than usual. Saturday has arrived bringing with it a calm and sense of relief. I wanted to share a photo that I took about a month ago. It’s one of those faces I was talking about yesterday. A nearby library that I enjoy visiting has a drive thru book return. I’ve gone through this book return countless times. On this day, a month back, I must have been in a slower mode, so that I could step back, see the book return from a different vantage point. I usually have to get out of my car because it’s a long stretch to push the buttons and place the books on the belt that pulls the books through to their destination with other books, waiting for re-shelving. As I began getting out of the car, I saw a face looking back at me. I smiled, then I laughed. Finally, I had to take a photo. One of the beauties in life is that simple moments like this can bring such unexpected joy. As I look at the photo this morning, I realize that the face is a familiar one. One of my father’s–my real father–used to build me beautiful creations out of wood. A cabinet maker by trade, he was a true craftsman and artist. Looking at this face, I remember a family of wooden dolls that he made for me. They were beautiful wooden blocks that he had cut, putting together a family, all with smiling faces, moveable arms and legs, and a rich coating of wood stain that brought out the beauty in the wood–a human family that brought me comfort and joy. Whenever I smell sawdust or freshly cut wood, I think of him in his wood shop, creating. I wish I still had those dolls. Even though they are gone, and he is gone, I remember the love that he put forth in all the creations that he built for me. I was able to keep and take one item with me, and it rests in my closet where I can see it. It’s a small wooden treasure chest that my father built for me, where I store my special treasures. It’s been a long week. I think I woke up in the early morning hours hoping it was Saturday and not Friday. But here I am with my cup of delicious decaf coffee; the morning is feeling pretty good. While I was cleaning out my lunch bag yesterday, I found a short story that I wrote about a month ago and had been carrying around because I wanted to edit it. I hadn’t gotten around to it. I tossed the story in my book bag to take to class to read during break. It’s a simple story. I read through it, and didn’t have much to change. I think I will post it soon–I’m telling myself that here on the page, so that I can hold myself to it. I’ve done that before; it doesn’t always work. This week at work we had one of our working “team meeting” lunches. There are only three of us. We went to one of my favorite Japanese restaurants this time. I’m the dreamer of the group. The others are creative in their own way and have fun sides, but are also very pragmatic. I often get sidetracked when we walk to our destination. I get lost in the sky, the flowers we pass, the cloud formations, the window displays–I love interacting with my environment and being right there. When our miso soup was served, I looked inside my bowl before taking it in my hands to take a sip and I saw a face–I actually see faces a lot–not a whole lot, but I see them enough, I see the spirit in things. But, back to the soup. The onion slices and tofu were making the cutest face and I said to them there’s a face in my soup and pulled out my iPod Touch and snapped a photo. 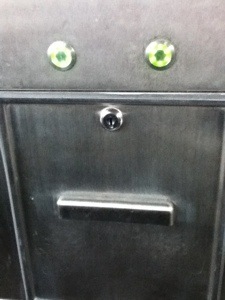 The boss had a flippant comment in response to when I said I see faces in things. I’m used to it; and I think he’s used to my fascination with life. Mindfulness is as simple as seeing a smile in a bowl of miso soup. It was a crisp night at school last week. I looked up at the sky as I usually do and I breathed in the clarity. I walked by a tree and snapped as many pictures as I could with my mind, so that later when I felt the moment was right, I would try to capture it in words. The moment came when I was waiting for my car to warm up the following morning. (it’s really a small pick up truck, but I call it my car). As I was waiting, I took in the sights. My eyes paused on a tree that reminded me of that night. I took out my miniature notebook and sealed the moment in my memory. Driving down the highway, we pass hills and trees. I keep my eyes open for cows; and then I see Coots, those black bundles that get a running start on the water before they take off; and I see one lone bird perched high in the branches, small and hidden away, but seeing everything. And on this past Saturday, the clouds formed a parachute, wrapping the sky in a weave pattern that made me want to climb on up and see the land from up above. Highway turned to narrow country roads and the image that has stayed with me is of one white Heron standing in the grassland with a fence between him and another white Heron on the other side of the fence. They were looking at each other from at least 15 feet apart–looking as though they had found themselves in a mirror, looking carefully and cautiously into each other’s eyes from that distance. It was a sight that like a pebble thrown into a still lake has rippled throughout my being. I’ve always appreciated that we each learn at our own pace; we each have our own timing, our own style of learning and taking in information and interacting with the world. I’ve wondered if I could be considered a late bloomer, but in some ways I’m still blooming and I think I might be past that late blooming point. I imagine that I will continue to open and close, and I will be a beautiful wild flower–I must tell myself that–because I don’t quite see myself as reaching a state of being in full bloom. I don’t necessarily see that as a negative, but I’m aware of it when I see how my quiet, introverted nature, will always be in a state of quiet bloom. 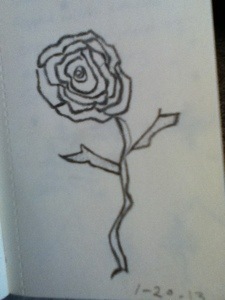 I doodled this flower on January 20, 2013 in my miniature notebook. I came across it recently and it seemed to strike a cord in me. Looking at it now, it has a playful optimism about it and it reminds me to remember to keep remembering to accept myself as I am and to love myself and to know that we each have a role on this earth; for some, the message is loud and clear; and for others, it’s subtle.